PITTSBURGH & CHICAGO--(BUSINESS WIRE)--Jan. 29, 2019-- Today, PLANTERS, one of America’s biggest snacking brands, unveiled a high-energy Super Bowl ad starring MR. PEANUT and not one, but two of his legendary friends – baseball great Alex Rodriguez and award-winning actor Charlie Sheen. 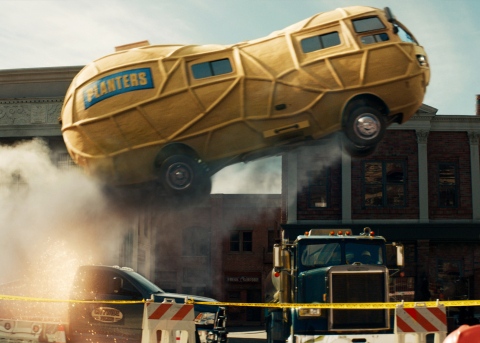 In the PLANTERS Super Bowl ad, MR. PEANUTtakes fans on a wild ride in the PLANTERS NUTmobile, stopping at nothing to save Rodriguez from snacking on boring, disappointing kale chips. At the last second, he saves the day with crunchy, crave-worthy PLANTERS Deluxe Mixed Nuts, proving that he’s always got his fans’ backs in crunch time. Turning up the energy – and the volume – MR. PEANUT’s nutty new spot also features a cameo by actor Charlie Sheen, along with MR. PEANUT’s favorite song, “Kickstart My Heart” by Motley Crue. Fans can watch the 30-second ad here to see how MR. PEANUT comes through with a satisfying salty snack, especially in crunch time. The commercial will air during the second quarter of Super Bowl LIII on CBS. Fans also can check out a 45-second, uncut version of the ad here. In addition to appearing in his first Super Bowl ad, MR. PEANUT will give away epic prizes during pivotal crunch time moments in the game. Follow @MrPeanut on Twitter for a chance to win amazing prizes - everything from signed Rodriguez memorabilia, to an oversized solid gold peanut, to having MR. PEANUT as your personal chauffeur in the NUTmobile for a week. For more information, visit Planters.com and follow MR. PEANUT on Twitter @MrPeanut.